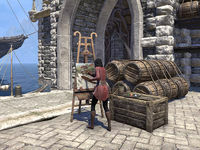 Help an artist in Rellenthil find meaningful inspiration. "I need someone who will give my work meaning. A depth of morality." Tableau is an artist fascinated by the outcasts known as hulkynd, and wishes to meet one. She's requested I help arrange a meeting with one who was seen outside of Rellenthil. Speak to the artist and accept the task. Travel to the outskirts of Tor-Hame-Khard. Speak to the hulkynd and help him complete a contract. Meet Tableau and Manacar near the Rellenthil sinkhole. Complete Manacar's delivery on his behalf. I've been requested to find the hulkynd who is currently in the wilderness outside Rellenthil. I should head there to begin my search. The hulkynd that Tableau wishes to meet has addressed me. I should speak to him. Manacar has agreed to meet Tableau if I fulfill his current contract. I should follow his pet wolf Cur to track down the indrik so I can collect its heart. I've killed the indrik. I should collect its heart for Manacar. I've collected the indrik heart. I should meet Tableau and Manacar at the sinkhole outside of Rellenthil. Finishes quest Manacar asked me to deliver the heart to a noble named Valtarion. I should travel to the inn in Lillandril to find him. This page was last modified on 15 November 2018, at 23:21.